Blogging is all about the community, right? Otherwise we'd all be sitting in our beds handwriting in our journal. I like it when I get feedback from my readers and I'm lucky that quite a few of you do comment regularly. So hello to my regular readers, and a big hello to all of you readers who read my blog and never say hi back. Today is your day. Come out, come out wherever you are. Hello! You know me, right? Not so much of a lurker these days, but thought I'd say hi anyway! Well Ahoy, I guess you know I read your blog. Hello! I know I've become a lurker lately.. I'm still here reading your blo, I just haven't been commenting on yours or anyones for that matter.. 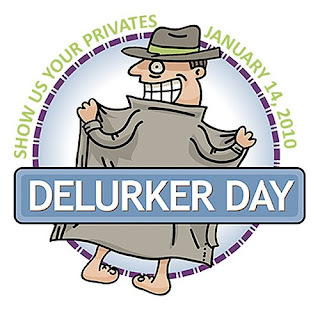 I haven't commented here for awhile, so Delurker Day is a good excuse. And I kind of agree with Suey about the logo, but I used it today anyway :-). Um. I am behind, can you tell? I think you had 19 new posts in my reader!